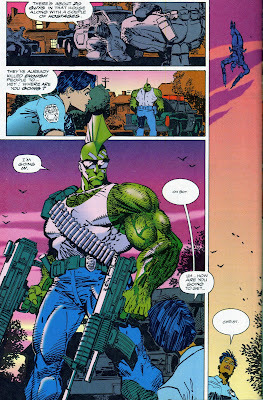 I Love Rob Liefeld | A Comic Book Blog: Those Image Moments: the Savage Dragon has serious hops. Those Image Moments: the Savage Dragon has serious hops. I've written before about a specific moment from an early 90's Image comic book, and I thought I'd share another one from that period. Like that Youngblood panel, I thought this was awesome when I first read it, and I never forgot it. Looking at it now, it's still pretty awesome. You can probably guess what happens on the next page, and I just wanted to focus your attention on this one. Part of what makes this great is that Larsen didn't show the Dragon crouching, pushing off the ground, or on his way up -- the cop is in the middle of a sentence and by the time she can say another word, he is already several stories in the air and flipped. That's pretty sweet, and a nice use of the comic book form. Those Image Moments: Wetworks strikes a pose. Adrian Tomine should loosen up. The Metabolists are falling apart.